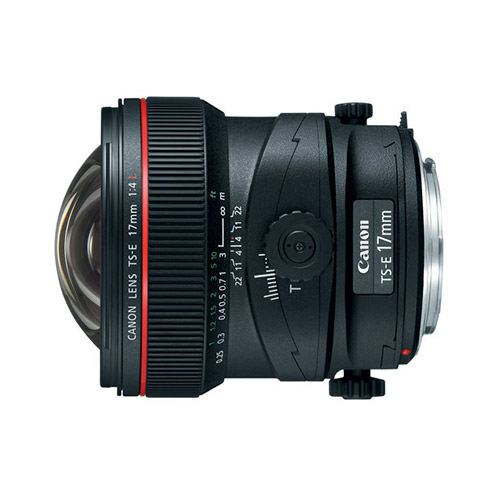 Lens Description: The widest tilt-shift lens in Canon\'s lineup, the new TS-E 17mm f/4L lens expands shooting possibilities exponentially on EOS Digital cameras. 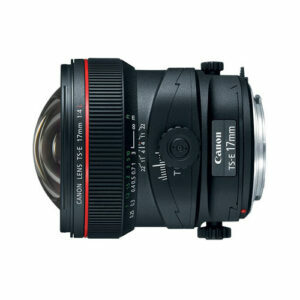 Designed with UD glass to minimize and compensate for chromatic aberrations, with a specially coated aspherical element for the highest possible glare-free image quality, this tilt-shift lens offers a diagonal angle of view of 104° on a full-frame SLR camera.New TS rotation lets users freely combine tilting and shifting within the range of +/- 90° in the direction of movement. The lens also has an improved tilt & shift knob with an enhanced range of movement of up to +/- 6.5° and 12mm repectively, with a revolving function for better operability.